My first contact with the Icelandic horse was on a geography lesson back in the 70's, when the subject was about Iceland, and I saw a picture of three different colored Icelandic horses. The years went by in the world of the "big horses", with good teachers, thanks to the dressagerider Arja Aminoff and the fieldrider Maria Möller. My studies brought me to Hyvinkää institute of agriculture and just when I was about to finish my studies to become an agrologist in 1989, I was offered the opportunity to buy my own icelandic horse, which I so long had dreamed of. When I stepped into the quarantine stables, my eyes fell on a red coated horse named Sólfari. After the test ride I was sold, and the horse became my own..... and so he is still today, after 20 years together. My headstrong friend has given me and many others, many memorable and instructive moments. Even as an old grandpa, he reminds us to never underestimate a horse. The years have passed and the number of horses has increased. Experience I have gained through courses and in real life together with both my own and other people's horses. 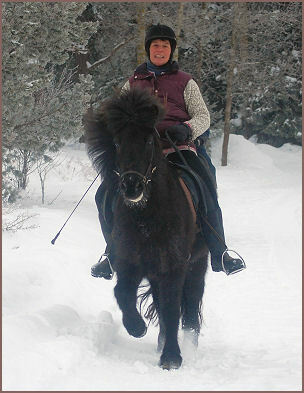 I wish you welcome to meet our lovely horses and enjoy our fantastic terrain.